Our demonstration shows two artworks that rely on recent Computer Vision and Augmented Reality techniques to animate the illustrations of poetry books. Because we don’t need markers, we can achieve seamless integration of real and virtual elements to create the desired atmosphere. The visualization is done on a computer screen to avoid cumbersome Head-Mounted Displays. The camera is hidden into a desk lamp for easing even more the spectator immersion. Our work is the result of a collaboration between an artist and Computer Vision researchers. It shows beautiful and poetic augmented reality. It is further described in our paper ‘The Haunted House’. OK, you see a Scandinavian guy standing in the middle of the yard with a cell phone held high in his hand. What’s the big deal ? Exactly! 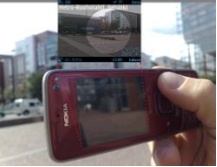 We demonstrate mobile augmented reality applications running on the newly released Nokia 6210 Navigator mobile phone. The device features an embedded 3D compass, 3D accelerometer, and assisted GPS unit – the fundamental ingredients for sensor-based pose estimation, in addition to smart-phone standards: forwards-pointing camera, high-resolution displays and internet connection. In our applications sensor based pose estimation is enhanced with computer vision methods and positioning error minimization techniques. Also the user interface solutions are designed to try to convey the relative uncertainty of the pose estimate to the user in intuitive ways. We have developed a system built on our mobile Augmented Reality platform that provides users with see- through vision, allowing visualization of occluded objects textured with real-time video information. The demo participants will be able to wear our lightweight, belt- mounted wearable computer and head mounted display. The display will render hidden locations captured from the University of South Australia. These locations consist of 3D models of buildings and courtyard areas that are textured with pre-recorded video images. The system includes a collection of visualizations and tools that assist with viewing these occluded real-world locations; e.g. digital zoom and texture highlighting. Services. None of these demos has been shown before at a scientific conference making it a unique experience for every ISMAR attendee. All our demos are hands-on: During our demos we will hand out devices and let people experience our applications. In a dark, corner room the size of a closet, about 150 people are gathering around an artifact from the future…. We present a simple and low-cost method of superimposing high dynamic range visualizations onarbitrary reflective media, such as photographs, radiological paper prints, electronic paper, or even reflective three-dimensional items. Our technique is based on a secondary modulation of projected light when being surface reflected. This allows boosting contrast, perceivable tonal resolution, and color saturation beyond the possibility of projectors, or the capability of spatially uniform environment light when illuminating such media. It holds application potential for a variety of domains, such as radiology, astronomy, optical microscopy, conservation and restoration of historic art, modern art and entertainment installations. In this demonstration we show how the Apple iPhone can be used as a platform for interesting mobile phone based AR applications, especially because of its support for multimodal input. We have ported a version of the ARToolKit library to the iPhone and customized it for the unique input capabilities of this platform. The demo shows multimarker-based tracking, virtual object rendering and AR overlay, gesture-based interaction with shared virtual content, and accelerometer input. This demonstration shows some of the possibilities of AR when there is no hardware to configure, no interface to learn, and the interaction is natural and intuitive. You have to live down-under to conceive a machine that simulates bad weather…brilliant! This demo presents ARWeather, a simulation application, which can simulate three types of precipitation: rain, snow, and hail. Our goal is to fully immerse the user in the simulated weather by multimodal rendering of audio and graphics, while preserving autonomous and free movement of the user. 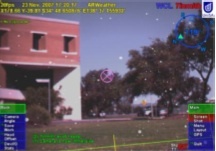 Therefore, ARWeather was developed and deployed on the Tinmith wearable computer system. Software highlights of this demo include: GPU-accelerated particle systems and video processing, spatial audio with OpenAL, and physics-based interaction of particles with the environment (e.g., hail bounces of the ground). I never would have learned about this ancient plate’s history – had AR not been invented. A Classic. information is provided by multimedia tools, offering the visitor various approaches to the artwork. Adding information with augmented reality is intuitive and offers an illustration of something that cannot be seen by the naked eye, without turning away the visitor’s eyes from the real artwork. 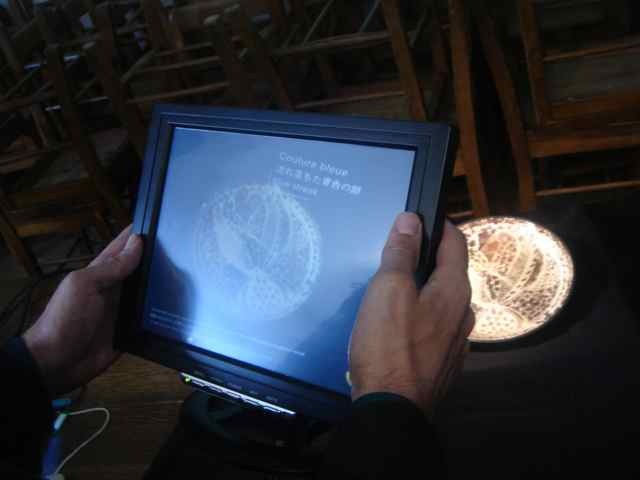 The system is currently in use at the Louvre – DNP Museum Lab (LDML) – Tokyo/Japan. 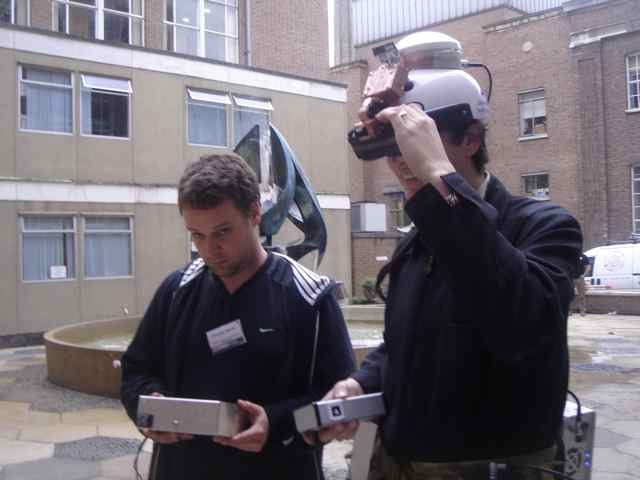 A demonstration of a wearable robotic system that uses an extended version of the parallel tracking and mapping system by Klein and Murray from ISMAR 2007. This extended version allows multiple independent cameras to be used to build a map in unison, and to also create multiple independent maps around an environment. The user can explore an environment in a natural way, acquiring local maps in real-time. When revisiting those areas the system will select the correct local map and continue tracking and structural acquisition, while the user views relevant AR constructs registered to that map. Wow, really wish I was there now. This is a great review of everything. I’m still most interested in the development of HMD solutions,our current cubic mobile phones being a stop-gap. The picture of the see though HMD doesn’t match the description well though. (“light weight”? Guess its all relative ;) ). Wish there was more videos though to see how effective this stuff was from a user perspective. All good stuff though, and 2007 markerless tracking is still incredible.